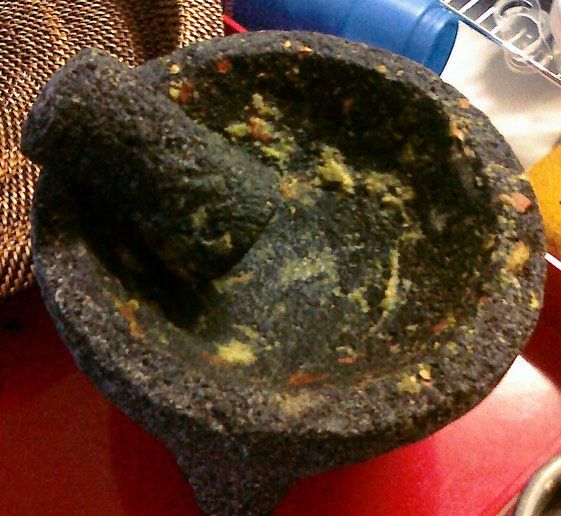 It should have been picture of a molcajete overflowing with the most delicious guacamole ever but once I started making it my mind went blank of everything except eating it and didn't clear up again until I had licked the bowl clean. So I forgot to take a picture. The recipe I use is from Williams and Sonoma. It came with the molcajete, which was a wedding gift. I mean I registered for it but I never would have bought it on my own. I registered for it because a) it looked freakin' cool and I could imagine having it setting out on display in my kitchen and b) the best guacamole I had ever had to that point had been made at my table in a restaurant using one of these things. I've tried a bunch of different recipes for guacamole since acquiring this gadget but have never come across any that consistently turn out this delicious. I thought I would share so that you might enjoy too. You don't need the giant mortar and pestle but it doesn't hurt. Combine the above items in the molcajete and grind them into a paste. If you don't have one, you can use a blender or if you like things chunky just leave them as is. Mix, mush, stir, pummel whatever to the consistency you desire. I like mine a little on the chunky side but I know a lot of people who like is smooth. Finally, and this is crucial, serve it with Hint of Lime tortilla chips. You won't be sorry. Make this for someone you love and they will love you just a little bit more, in return.